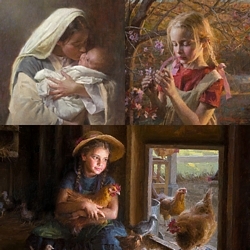 “The one-room schoolhouse goes back to the founding of our great country,” says artist Morgan Weistling. “It evolved through the decades but the general idea remained the same. I painted the time period that I know and love best, the post Civil War era. I decided to place the teacher as the focal point, a tribute to all the dedicated teachers that help build this nation. “This is a rural country schoolhouse and I wanted to portray a class that was a little more primitive. They were still using individual chalk boards instead of pen and paper (because of the cost of paper then). No fancy bows and frilly dresses for these kids. I imagined these children as coming from a farming community as well as tradesmen’s homes.